I wanted to re-post this because last night I had Tony Szabelski on my radio show Bridging the Paranormal and we talked about a lot of the things I posted about here. Tony was a great guest and you guys go back and listen to the archives from last nights show. It was good! This is an EXCITING post for me because I went to Chicago last month and hung out with my good friend Michele Pellegrino. Her good friend, Tony Szabelski and our private tour guide for one of the nights of ghost hunting. We went to the VERY creepy Channing Elementary School and Park and then to the OH SOOOOOO COOL Bluff City Cemetery to investigate. Man was it a GOOD TIME!!!!!!!!!!!!!!!!!!!!!!!!! Did we get anything GOOD???? Check out the video below and you tell me??????? Channing Elementary School has the unfortunate distinction of having been built over what remained of Elgin's first cemetery in the 1940's, most of the graves were moved to accommodate a new sports field, but in the 1960's, when construction crew broke ground on the new elementary school, their equipment began to uncover human remains. Since then, faculty and staff at Channing Elementary has reported an elevator that seems to move on its own, footsteps on the roof, dark figures, and even scratching on the walls. Today, a stone monument to the dead buried at the original cemetery sits at a nearby park. The school is said to have used stones that were from the cemetery during construction. The Park and the school are right beside one another. As we walked back to the corner of the park along the tree line, we kept thinking we could hear children. It was on a Monday night and late therefore, we didn't believe it to be "real" children talking and laughing because we could not see anyone around. My equipment started malfunctioning when we were over by one of the last remaining tombstones of the cemetery. Our Boo Bear, a piece of equipment designed to interact with spirits and particular child spirits was going CRAZY!!!!!! We were having all kinds of flashlight communication along with a parascope going off. They were all VERY active. What a great little place. 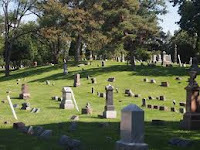 As we were walking back from the park toward the Bluff City Cemetery, you can hear in the clip above a very CLEAR VOICE which we consider to be a Class A EVP of a little girl saying "I want to go". Did she want to go with us??? To the cemetery.....or HOME with us????? Who knows. Michele kept thinking she could hear footsteps as we walked back on the sidewalk which is suppose to be laid over some of the remaining bodies that could not be moved. Michele could have had more than just me on her couch!!! First, have you ever seen Nightmare on Elm Street? And especially Part 5??? Then you might recognize this place. Yes. It is where parts of Nightmare on Elm Street Part 5 were filmed. That even adds to the whole "CREEP" factor of this place!!!!! 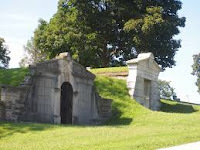 The Bluff City Cemetery is located at 945 Bluff City Blvd., in Elgin. It was established in 1899 on 107.8 acres of hilly, cliff-like land. The land could not be used for planting or building so a cemetery was the natural choice. There are approximately 43,000 "residents", but the cemetery's capacity is 70,000. To give you an idea of its large size, it takes 1200 man hours to rake all the autumn leaves. This place is sooooooo large........that it seems for miles and miles of rolling hills, shadowy trees, and small roadways all you can see are tombstones. SCARY??? YEP!!!!! IT IS!!!!!!!!!!!! So, we were REALLY lucky that Tony Szabelski gives tours here so he knows everything about this place! As we walked up on the sidewalk in the dark only using our flashlights to see.....as we entered the cemetery you automatically felt that you were NOT ALONE!!!!!!!!!!!!! Well.....besides.......being surrounded by huge monuments and tombstones.....you definitely felt that SOME of the spirits were glad you were there.....and some NOT SO MUCH!!!!!!!!!!!!! Now, the FIRST thing Tony does is.......take us down this long, dark road with a canopy of trees over us! Was it DARK??? ?YES PEOPLE IT WAS DARK!!!!! Now Tony starts in with saying how much activity he gets here during his tours. 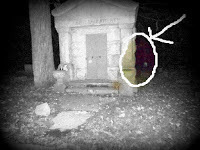 He takes us to this mausoleum type grave and sits up a Raggedy Andy doll. Below is a little of that session. It isn't the best I am still trying to figure out the FB Live but you can see how CREEPY this place was!!!!!!!!!!!!!!!!!!! We almost instantly started getting communication. 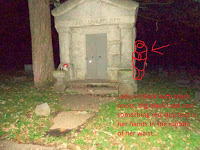 Below is what appears to me a woman in a long black furry coat with a hood and something red (kinda hard to see) clutched in her hands in front of her. For some reason, it seems to strike me as............well............a woman that might be at a funeral in the wintertime. What do you think? Do you see what I am talking about???? So we put down the Boo Bear and started asking questions when in a distance we could clearly hear what I can only describe as two pieces of hollow wooden sticks being banged together. Like what you would see in the movies of Indians dancing around a fire with wooden sticks above their heads hitting them together again and again. I am not sure of the entire story (you will have to ask Tony) but he said something about Indians used to be there on the land before it was a cemetery. Tony and Michele started hearing this explainable noise as well. Tony said he had been doing the tours for years and had NEVER heard anything like that!!!!! It was picked up on our audio but I am STILL going through the EVP's from both locations. You know....when you have TWO recorders at TWO different locations....because....I don't want to miss a thing LOL........suddenly you forget how much time it takes to review those audio tapes. Man.......it's never ending!!!!!!!!!! Our last stop to me was the BEST!!!! We stopped on top of a hill where there were some cannons and a beautiful angel statue that was a Dr. and his wife's grave. We immediately started getting words on our Spirit Box like....."nurse, help, sick. medicine". Now, Michele ask "Is there someone here tonight you want to talk to"????? And YEP.......you guessed it...........it said BECKY!!!!!!!! Well I was being noisy and had my back turned to the Spirit Box taking pictures of what was behind us because we kept hearing footsteps. Now, when I hear my name....I just STOP........slowly turn around and say....."OH NO..........you don't know me........I'm from Texas!" LOL It still seemed to answer questions that in some way were directed toward me. It was getting late my now so we packed up and headed out. But the Spirit Box session was TOTALLY amazing!!!!! I will be sure and post more EVP's when I finish going through them. Ok.......rather long tonight but hopefully you enjoyed it and if you haven't already......Don't forget to go VOTE!!!!!!!!! !